Tsai Ing-wen is promoting her alternative ‘Taiwan consensus,’ but the KMT remains committed to the 1992 consensus. In his January 2 speech to commemorate the 40-year anniversary of the normalization of U.S.-China relations and Beijing’s “Message to Compatriots in Taiwan,” Chinese President Xi Jinping again called for the peaceful unification of China and Taiwan. Xi reiterated Beijing’s support for the “1992 consensus” and the “one China principle,” while offering Taipei a promise of “one country, two systems” as a way to accommodate Taiwan’s current de facto independence and democratic legal system. The “1992 consensus” refers to talks held in Hong Kong in 1992, when representatives of the mainland-based Association for Relations Across the Taiwan Straits (ARATS) met with delegates of Taiwan’s Straits Exchange Foundation (SEF) to discuss cross-strait commercial exchanges and the definition of the “one China principle.” According to Beijing’s recount, ARATS offered that the definition “can be left open to discussion,” so long as the Taiwan side acknowledges the “one China principle.” Following discussion, a SEF representative proposed the “one China principle” to be interpreted by each side in a way it sees fit, which ARATS accepted and excluded discussion of during cross-strait commercial talks. 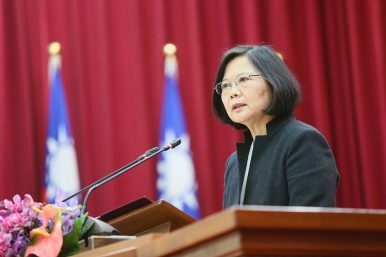 The agreement is widely referred to as the “1992 Consensus,” although Taiwanese President Tsai Ing-wen, her Democratic Progressive Party (DPP), and 45.1 percent of Taiwanese believe there never was such a consensus. [Beijing] must face the reality of the existence of the Republic of China (Taiwan); it must respect the commitment of the 23 million people of Taiwan to freedom and democracy; it must handle cross-strait differences peacefully, on a basis of equality; and it must be governments or government-authorized agencies that engage in negotiations. The End of the 1992 Consensus? With Tsai seeking to displace the “1992 consensus” with her own Taiwan consensus, and the majority of Taiwanese apparently opting not to accept Beijing’s definition of the consensus, does this spell the end of the 1992 consensus? Perhaps not. According to the above poll, 20.9 percent of Taiwanese believe China and Taiwan “are two parts of the same country waiting to be united” with 20.6 percent holding the view that each side has the right to claim that it represents all of China, and 7.1 percent believing the Republic of China is a local government of the People’s Republic of China. And while the losses suffered by Tsai’s DPP on November 24 were over domestic issues more than a direct result of her administration’s cross-strait policy, the rise of the KMT may signal greater political accommodation of more friendly cross-strait ties. The “1992 consensus” is not quite dead, as some KMT politicians in Taiwan will seek to resuscitate it, and the DPP’s new “Taiwan consensus” has yet to prove its stickiness. While some Taiwanese may be tempted by Xi’s honey-laden offer of “one country, two systems,” other Taiwanese will look at Hong Kong as an example and be mindful of its sting. Gary Sands is a senior analyst at Wikistrat, a crowdsourced consultancy, and a director at Highway West Capital Advisors, a venture capital, project finance and political risk advisory. A former U.S. diplomat, he is now based in Taipei. Was It Wise for Tsai Ing-wen to Reject the ‘1992 Consensus’ Publicly? Taipei has to face the fact that it does not have much leverage to resist Beijing’s pressure now.